The Indian Space Research Organisation’s GSLV-FO2 may have gone up in flames but there’s little reason to get disheartened. The story of Indian space ventures and ISRO’s experience show that despite the recent loss, the ambitious programmes are very much on course. Sridhar K Chari reports. SRIHARIKOTA is a small island off the Andhra Pradesh coast, some 80 km north of Chennai. A 20-minute drive from Sullurupeta on the Chennai–Kolkata national highway, over the shallow backwaters of the Pulicat Lake which bounds the island to the west, will take one to the hallowed ground of the Satish Dhawan Space Centre, formerly known by its acronym SHAR – Sriharikota High Altitude Range. To the east is the pristine blue of the Bay of Bengal. On the evening of July 10, 2006, the SDSC was abuzz. The Geo-Synchronous Launch Vehicle (GSLV) F02 was standing tall at 49 metres on the newly constructed second launch pad. It was around 5.30 p.m, and the launch pedestal, with the vehicle, had already moved away about one kilometre from the service tower. Space vehicles are essentially of two kinds – launch vehicles and satellites. Launch vehicles are rockets which move so fast that they can escape earth’s gravity and zoom into space. They usually carry satellites which they eject into two kinds of orbits, polar sun-synchronous, which follows the sun as the earth turns, and geo-synchronous, where the satellites remain stationary in relation to the earth, some 36,000 km above us. The GSLV, as its name suggests, is of the latter kind. India has flown it three times before. There were two "developmental flights" designated D1 and D2, which carried experimental satellites GSAT-1 and GSAT-2. The first operation flight (FO1) launched EDUSAT in September 2004, which is currently being used to beam education programmes and link schools all over India. So the GSLV was a successful, "tried and tested" vehicle. But launch technologies are very complex. The phrase rocket science did not enter common parlance as a synonym for extreme complexity for nothing. Powerful engines (called motors) fuelled by tonnes of highly inflammable solid and liquid propellants give it the enormous thrust that is required for lift-off and flight. On board sensors and computers monitor everything that is going on and control the vehicle, besides relaying information back to ground stations. Directional thrust is constantly corrected to keep the vehicle on its intended trajectory. The GSLV’s first stage is powered by a core motor with 138,000 kg of a solid fuel with four "strap-on" motors, each with 42,000 kg of liquid fuel. The second stage has another 39 tonnes of the same liquid propellants. And finally comes the Russian supplied cryogenic stage, with 12.6 tonnes of liquid oxygen and hydrogen. Right on top is the 7.8 metre long "payload fairing", carrying the INSAT 4-C satellite. Seven kilometres away from the launch pad, are the telemetry and command consoles. There is no human being anywhere in the sanitised zone. At 5.38 the countdown begins. The strap-on motors are fired. A few seconds later, the core motor ignites and the 4,14,000 kg mammoth lifts off. But something was wrong. "The pressure in one of the four strap-ons dropped to zero," ISRO Chairman G. Madhavan Nair was to say later. Almost immediately after the core was lit, the strap-on shut down. Variation of up to four degrees can be controlled. But with no thrust coming from one motor, and after 40 to 50 seconds of flight, the variation in trajectory was about 10 degrees. The GSLV-F02 was clearly, and irretrievably, off course. The Range Safety Officer independently gave the self-destruct command, and the scientists watched gloomily as launch vehicle and satellite went up in fire and smoke. The strap-on liquid motor has given trouble before. 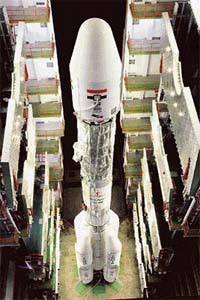 The GSLV’s first ever light, the D1, was originally scheduled to fly on March 28, 2001. After the strap-ons were ignited, and just one second before the core was lit, the Automatic Launch Processing System (ALPS) discovered that one of the strap-ons was not producing enough thrust. It just shut the whole process down. A flaw was detected in the plumbing of the oxidiser flow line, and this was subsequently corrected. It flew successfully 20 days later on April 18. 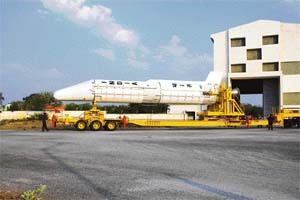 India’s rocket development history did not actually begin at SHAR, but at the Thumba Equatorial Rocket Launching Station near Thiruvananthapuram. Small rockets known as sounding rockets, which are used for a variety of mostly experimental purposes, are flown from Thumba, and the first indigenous sounding rocket was Rohini. Rohini RH-75’s diameter measured a mere 7.5 centimetres. The first actual satellite launch vehicle, the eponymously named SLV-3, did take off from SHAR, in 1979. Its second stage failed however – a jammed valve led to oxidiser leak. The second attempt, a year later, succeeded. It placed a satellite, also called Rohini, the RS-1, in orbit. Two more launches of the 22 metre long vehicle followed, with more Rohinis settling into orbit. And India’s space programme was on its way. Only to stumble again with an augmented version — the ASLV. The first two developmental flights, in 1987 and 1988, both failed. Finally, ASLV-D3 was launched in 1992, with the SROSS-C satellite. ISRO’s scientists were now ready for the first PSLV, the Polar Sun-synchronous Launch Vehicle. 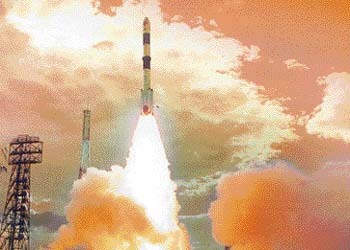 The project had been initiated in 1982, and more than 10 years later, in September 1993, PSLV D1 took off from SHAR. On board was the IRS-1E satellite. Most systems were performing normally, and things looked good. But two small rockets known as retro rockets failed, resulting in a fatal contact between the second and third stages, when the second stage was separating in flight. There was also a software error in the ‘pitch control loop’ of the on-board guidance and control processor. Pitch movement is the up and down movement of the vehicle in air, which has to be controlled to keep the vehicle in intended trajectory, along with sideway movements known as yaw. PSLV D1 had failed. Then things turned. The successful flight of ASLV-D4 in 1994, quickly followed up the same year with PSLV D2, was to set up a superb track record of 12 successful flights over the next decade and a half, broken only with the GSLV F02. In that intervening period, ISRO went from just another struggling scientific establishment, to one of the more admired organisations in the world. It was doing well with both satellites and launchers. The world lauded its "success on a shoe-string budget." New Delhi was happy to put money in ISRO – something always came of it. Sanctions regimes like the Missile Technology Control Regime (MTCR) were slapped on it. It became very difficult for ISRO to procure what it needed. It had to make its own. It signed up with Russia for the purchase of cryogenic engines for its GSLV programme. The contract included transfer of technology for manufacture of the engines in India, but the US came down hard on Russia in 1992-93. The Russians managed to prevail, but only to the extent of giving India the engines. There was to be no transfer of technology. India started on its own cryogenic programme. Cryogenic engines are challenging, as they use liquid oxygen and hydrogen as fuel. To exist in liquid form, these gases have to maintain extremely low temperatures – "cryo" means cold. The last few years have seen a thawing of relations with the US, and several MoUs have been signed with NASA, along with MoUs with other space agencies. Nobody wants to keep ISRO out of the loop. There are still some ISRO labs on the notorious "entities list" of the US, however, prohibiting their companies from selling technology to them. The why of it is obvious. A launch vehicle, is, after all, a rocket. It can carry a satellite as payload, which it can inject into orbit. The payload can also be a megaton nuclear warhead, in which case the rocket is simply a missile. And big powerful rockets like the GSLV can go a long, long way, to deliver its payload, on a target on earth. Cryogenic engines are not really suitable for missiles. For a missile, you need high mobility and speed in mobilising. Conventional solid and liquid propellants are preferred, like in the Agni. An advanced variant of the Agni, intended to deliver war heads 3500 km away, also failed, just a day prior to the GSLV launch. Agni is a DRDO programme, but it is no secret that ISRO, masters at launch and propulsion technologies, have "helped out" quite a bit in the Agni programme. The Agni failure would have hurt ISRO as much as DRDO, and they will be looking to put things right. But that record of 12 flights hides a partial failure, of the PSLV C1, again pointing to the uncertainties in the launch business. C1 was the PSLV’s first operational flight, and it was carrying the IRS 1D. While the first three stages of the flight performed well, the last stage fell short off the mark. Instead of ejecting the satellite in its intended orbit of 817 km above the earth, IRS 1D was in a funny orbit where the lowest point was at 301 km, and the highest at 821 km. On board thrusters had to be fired to raise the orbit, using up valuable fuel. Some three years of satellite life could be realised. India’s first satellite was, of course, the famous Aryabhatta, launched from foreign shores in 1975. Today it has a successful track record with both its INSAT series of communication satellites, launched outside India, and the IRS series of remote sensing satellites, used for earth imaging. The remote sensing programme includes the innocuously named Technology Experimental Satellite (TES), India’s only spy-satellite. 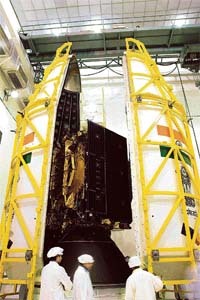 Its on board camera is capable of one-metre resolution, and was launched by PSLV C3 in 2001. The Kargil intrusions, of course, were what prompted the government to ask ISRO for this satellite, and it is doing good duty keeping an eye on happenings on our borders. The satellites have had their failure too. INSAT 2D for example, had to be abandoned soon after launch in 1997, as it lost "earth-lock." Today, ISRO has every reason to shrug off the F02’s failure and look ahead with cheer. The next PSLV flight will take place later this year. The GSLV D3, the "Mark II" with an indigenous cryogenic engine, is scheduled for the first quarter of 2007. The GSLV Mark III is waiting in the wings. The Mark III has a "beautiful configuration," in the words of former ISRO chairman K. Kasturirangan. The vehicle, with only two strap-ons, a single liquid core and a cryogenic stage is indeed awesome in its spare elegance and intended power. The strap-ons are huge 200 tonne solid motors, and the cryogenic stage is a 25-tonne monster, as against the 12 tonnes of the Russian supplied engine. It can place a four-tonne satellite in orbit. As pop wisdom has it, when you reach for the stars, you might not quite get them, but you "won’t come up with a handful of mud either." But the scientists will be keeping their fingers crossed. As Kasturirangan once noted: "Working with space technology, there are things I cannot explain even now." After all the reviews, the checks, the rigour and the thoroughness, there is that small "insignificant" thing which you have to just "leave to Providence".